This recipe actually comes from my sister Juanita’s neighbor, whose mother made them in rural Pennsylvania. Juanita sent me some at Christmas last year, and I liked them because they have that Christmas smell (see last week’s post). Also they will keep for a week or two in a tightly closed plastic container, which is a plus sometimes, and they freeze well. Anyway, I thought of them when I needed to make cookies for my book group, so I called Juanita and got the recipe. When I baked them, they didn’t rise, and they cooked faster than planned. Hmm, I said to myself, and called my sister Glenda. Glenda said, maybe it’s because you used a dark cookie sheet? Then she read the recipe to me, to make sure I had it all. Woops! I had left out the baking soda. End of the story: even without baking soda, they tasted fabulous. So I took them to book group, and they snarfed them down, and requested the recipe. Juanita called afterwards for a report, so I had to admit my mistake. She laughed, and said the first time she made them, they ran all over the pan. Her neighbor forgot to mention the flour when she gave her the recipe! So here’s the deal. If you want them the way they are supposed to look, and with the texture they are supposed to have (a little bit puffy and cakey), follow the recipe precisely. If you have dark cookie sheets, lower the temperature by 25 degrees! If you want them chewy and not puffy, leave out the baking soda. It works just fine. Also, this recipe can be halved. It makes an inordinate amount of “rocks.” P.S. For some reason, this image will not rotate! Makes me crazy. Just turn your head sideways to see what the non-baking-soda version looks like. Cream butter and sugar. Add eggs. Add dry ingredients and baking soda (batter will be stiff). Fold in the dates, raisins, and walnuts. Drop by spoonfuls onto ungreased cookie sheets. 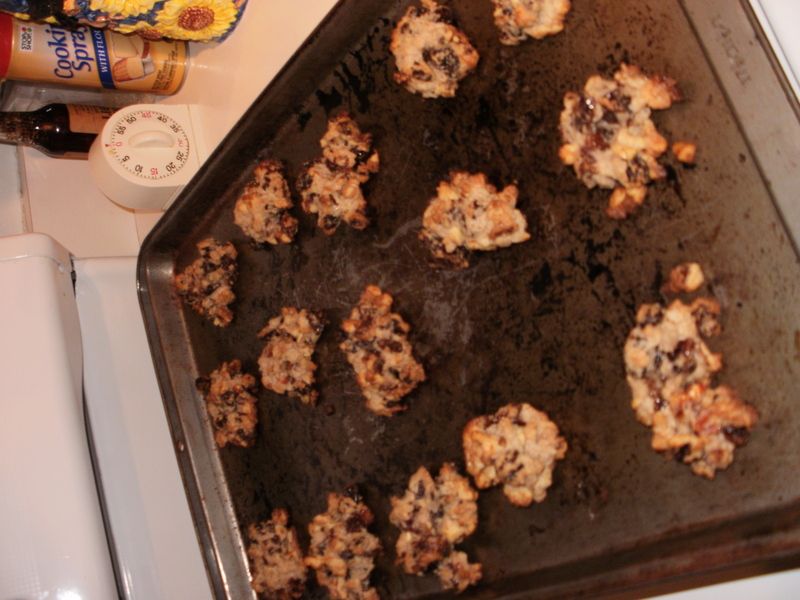 Bake at 350 degrees for 15-20 minutes (if using dark cookie sheets, bake at 325 instead). Makes 5 – 6 dozen.